Ok, here I am back with the easy stuff. Gina wants me to strut my skillz, but the truth is, now that I have kids, those complicated projects are few and far between. Much more often, I pick up fabric on a whim and spend an hour making a super-easy dress while also avoiding taking part in the housecleaning spree that my husband is on. It's win-win! So, above we have our cute little finished product. I'm just giving directions for the dress here...you'll have to figure out how to make your own little girl to go with it. This dress looks much more impressive until you realize what the fabric I started with looks like. The big secret is that it comes already gathered at the top! But you don't have to mention that to family and friends who ooh and aah over your creation. I won't tell. Anyway, in order to figure out how much of this fabric you need, you should measure the little girl's chest. Maya, who is going on 4 is pretty average sized and she was 21 inches around. Knowing that I wanted the dress to be just smaller than her measurement and I wanted enough left over for a couple little straps, I bought 25 inches of fabric. And ended up with no scraps. 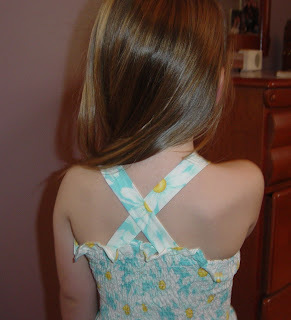 Step 1 is to pin the fabric around your little girl, stretching it just enough so it would stay up without straps, but not tight enough that she'll make you regret it. Guessing by how much I had left over, I'm guessing Maya's was 19 1/2 -20 inches around. 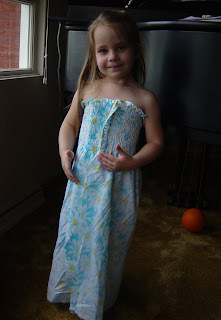 Sew the seam from the very top to the very bottom, making, in essence, a giant tube top. out. (See bag project below for rant on turning straps inside out.) Iron the straps flat. Put the dress back on your model (still inside out) and eyeball where you want them to go. Pin them with the strap seam showing (cause we're still inside-out here) on on each side of the front and back. Because I was feeling extra-fancy today, I pinned mine so they made an X on the back. While you've got it on your model, you could also pin up the hem to the length you want it. I just pin it in one spot, then lay it flat on a table to pin the rest of the hem. Turn it under twice so the scraggly threads don't escape. I might buy some ribbon and make a little tie belt around the waist. It would be easy to sew it around the front and sides, then leave the back open so you can tie it in a box. I'd stay away from sewing anything all the way around the waist, since you want the fabric to stretch and give easily for putting on and taking off. 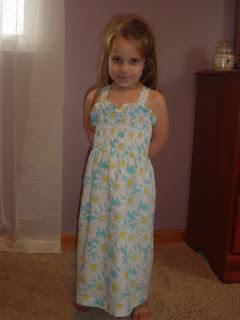 And there you have it...a dress in under an hour! 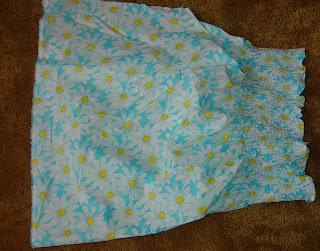 I forgot to mention that they had this fabric in adult lengths, too, so if you want to make an easy summer dress, you don't have to be under 4 feet tall! Neighbor's Yard Waste = Lovely Home Decor!